We have been Greenlit! We hope to come to Steam as soon as the game is complete! 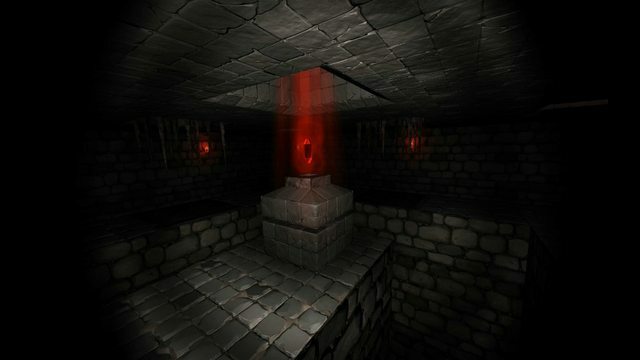 Crystal Rift is an experiential horror challenge game that takes the player through a series of increasingly mysterious locations. The game has been developed primarily for Virtual Reality headsets such as the Oculus Rift and GearVR, but is also a great experience for those without headsets. 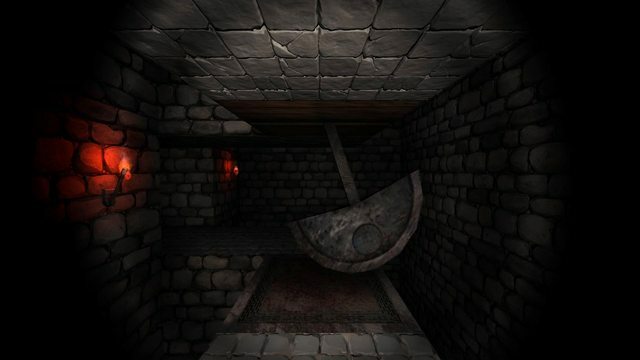 It was inspired by classic games such as Dungeon Master and Eye of the Beholder with grid-based movement. Hey folks! I am Nick Pittom, one of the two developers working on Crystal Rift, along with Jon Hibbins, who created the game originally. We're pretty excited about what we've been working on, and hope you like it. You are not required to. I'm not the boss of you. I merely entreat you to have a look at it all, and then decide it's pretty good. 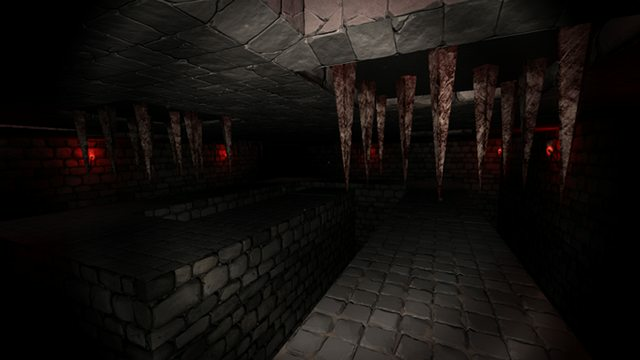 Jon has 25 years of experience designing and writing games and enterprise business software and was inspired by the games of yesteryear - Eye of the Beholder and it's cousins - to create his own Dungeon Crawler in their image. It was the opportunities and unique benefits of VR that finally gave him something to really get his teeth into, and thus Crystal Rift was born. I have been working on my own VR projects, which Jon was a fan of. He asked me to join the project at a developer meetup and I was extremely impressed with what he had managed to create, and saw the ways in which I could bring something to the project. I'm very excited to explore the ways we can build the experience with challenging puzzles, scary atmosphere, story and all the goodies that VR itself can bring. This dev-log will be our way of chronicling our path from the current alpha to the final product, hopefully getting some great feedback and giving other people some useful insights into our process. For now this is an introduction, but we're looking to go in depth into creative and technical aspects, including design of scares, narrative and how we're putting together our levels (it's quite ingenious!). For now, here's some pretty pictures! 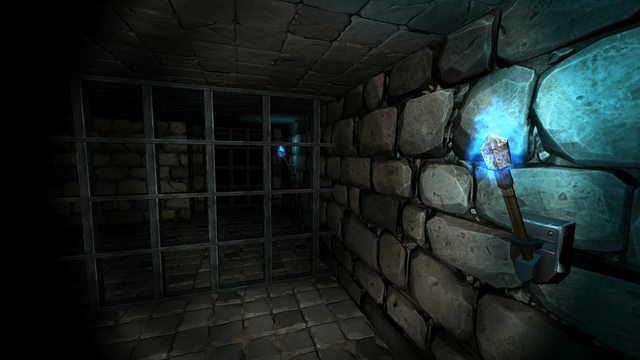 Classic dungeon crawling experience with grid-based movement, hidden rooms, pressure plates, trapdoors, fireballs, challenges, tactics and more. Over 20 levels, with evolving and changing environments. A unique and compelling story told through the environment, text and speech. 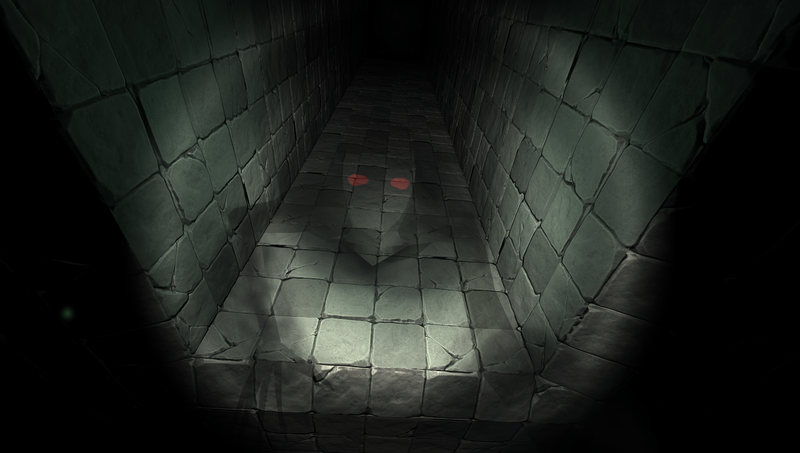 A very large part of the game are the puzzles and challenges - danger rooms with traps and complicated paths to navigate past them. There is no fighting in the game - no RPG style stat upgrages giving you more hit points or strength to beat giant spiders with. It's you verses the environment. Sure, some of the environment has demonic presences peering from the shadows - and you will need to watch out for those - but this is not a maze you can fight your way out of with fists - you have to do so with your mind. Symbolically. Literally would be messy and you would likely suffer severe brain trauma. 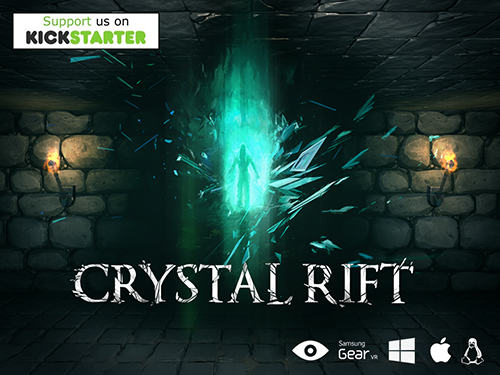 Crystal Rift was designed with VR in mind and everything has been optimised with that in mind - we're really blown away by the Rift and all the awesome possibilities VR offers. The ability to be INSIDE the game allows for not only a more compelling atmosphere and setting, but actual gameplay elements you would not get otherwise. But while we hope everything will get to play in VR, the game will not be VR only, as we want to give people the option of how they play. In any case we are looking to target as many platforms as possible, PC, Mac and Linux first, but consoles and elsewhere as well. The Samsung/Oculus GearVR is a very cool piece of kit and we absolutely want to be one of the first games on the platform. We hope to bring some insights into VR development as our blog continues, but feel free to ask questions or make requests! There are SO MANY aspects of VR that pretty much everyone is still working out and it's an exciting, fast moving area to work in. We're using Unity3D to build the game - it's pretty awesome in general, but especially so for VR. Additionally, it was well suited to our 'tile based' movement and level creation. Jon has managed to create a very aggressive optimisation system, with very efficient culling and draw times - perfect for VR, including mobile VR such as GearVR. 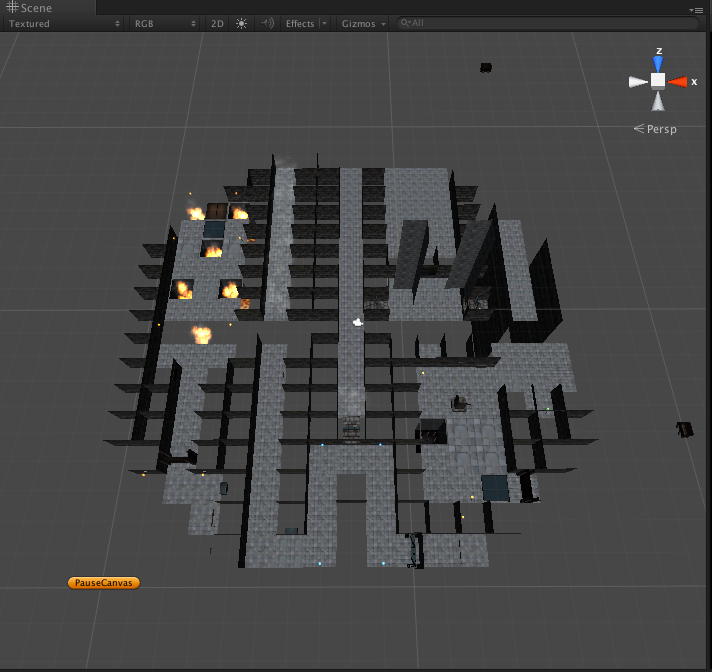 Another benefit of the method Jon has taken is that the editor we use to create the game is also going to be readily available to release with the game, and allow people to make and share their own levels. 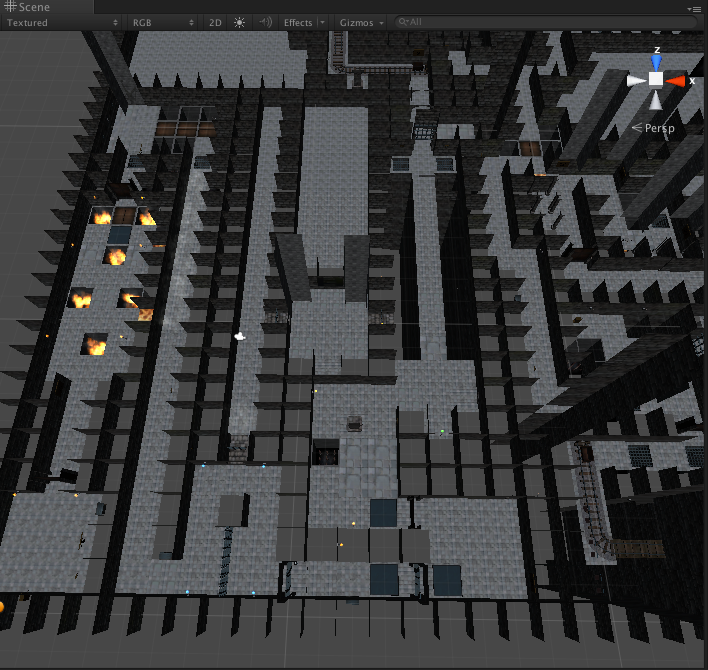 The game will have more than 20 levels, with an evolving art style as the story unfolds. This also means a varied selection of 'tile sets' to chose from to build your own levels. Custom assets are also planned for support some time after the game launches. Storytelling is one of my own focusses for VR and game development and we are hoping to create a compelling and original narrative, told in part through the environment itself, but also through messages scrawled or otherwise left by previous occupants. Storytelling is difficult at the best of times, and even more so in games. It's a challenge, but a fun one. Important to that storytelling is the atmosphere we're building, with scares and creepy elements being a particularly tricky element to get right. We discovered early that jump scares can perhaps, in some situations, work well, but only when used very carefully, and indeed some people outright hate them. In VR these elements can be particularly jarring and many people have difficulty with them. An innovation we're particularly proud of is the ability to customise your 'scare' level. 'Standard' play delivers you the game experience as it was designed to be, with a creeping dread giving way to stalking creatures and shadowy threats. But we will also allow the play to turn this up to 'Extreme' allowing for a more intense experience, jump scares and all - with a final 'Scares off' setting for those who wish to play the game safe in the knowledge no horrible beasties are going to get them. Hopefully you'll all enjoy our updates and we'll both get something from it. Good times! Hi everyone, we thought it would be great to share some hints and tips we have discovered regarding Unity Optimisation for VR, I know it’s a list and a bit bossy but we feel strongly that the combination of these tips will help any game run well in VR on Unity. First up; develop for the lowest spec machine you want to target and optimise for that, developing on the state of the art scenario that you have custom built is not a machine people have, they have a couple of years old 670 or something, or maybe even and iMac or Gaming Laptop. VR is still very early and it makes good sense to allow as many people as possible to jump on board. It also makes sense to prepare for Mobile VR, such as GearVR, as you can provide faster better computers an upgrade via the Quality system. Remove ALL Update methods that do nothing, and have a switch off state when they are not needed. I’m sure we’ve missed some others, but that’s quite a list for now, if anyone has any other tips or comments on any of these please comment. I hope you found at least 1 tip here that helps your game, and of course most of these tips are also good for non-VR games. Here's an update to the occlusion culling Jon just completed - you can see the inner walls (unseen to the player) are now removed, improving performance further. For mobile VR this will be vital. A little Screen Shot Saturday action! 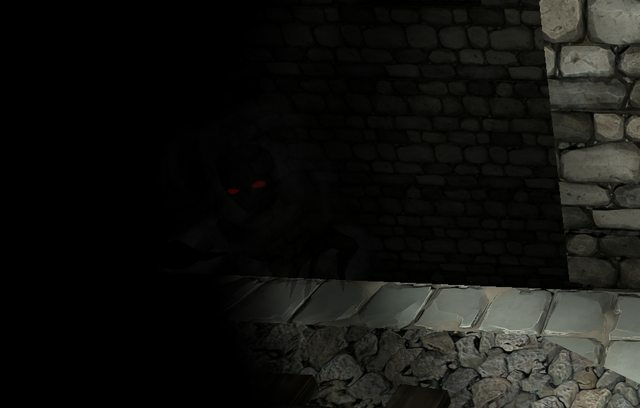 Here are a couple of stills highlighting the dark creatures that live in the shadows. Timed to drop at set intervals - we have a series of environmental hazards like these. Others include swinging axes or just pits with flames or spikes in, each of which can be used to build the flow and rhythm of play. 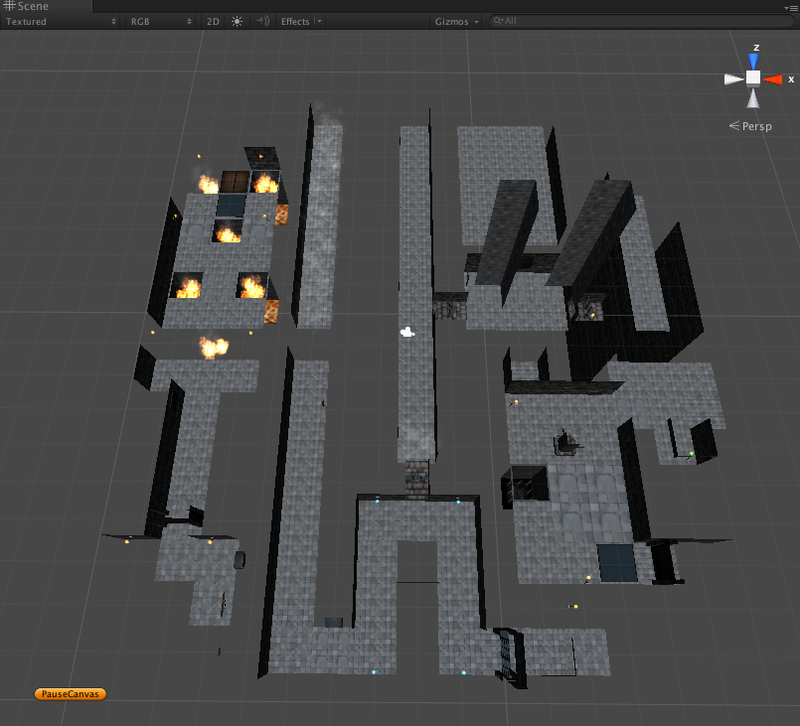 Throwing in more complicated hazards, such as fireballs, or walkways can complicate matters for the player. The way we're building these is very modular, and very customisable. If we wish to alter timing, or even have them only 'turn on' at certain times we can do so. Creating atmospheric scares... a hand in the darkness. One of our hazards... swinging axes. The image inside it is currently a custom reflection map of a level, but it will become a different environment, giving you a hint at where you have been before this. 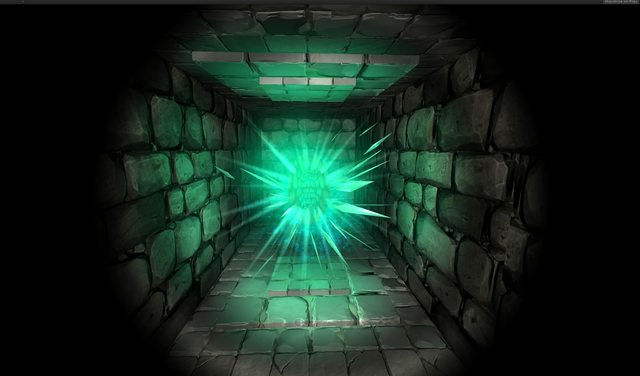 Essentially you are seeking a way out of the dungeon - and finding another rift will be a way to do that. We are now on Kickstarter! This will help us bridge the gap to GearVR and other platforms. The GearVR SDK is also out, so we can start testing the game out and ensure it's working for when the device is available. Always nice to see a dungeon crawler project I really love them! I'm working on one myself The Rise of Dagon. 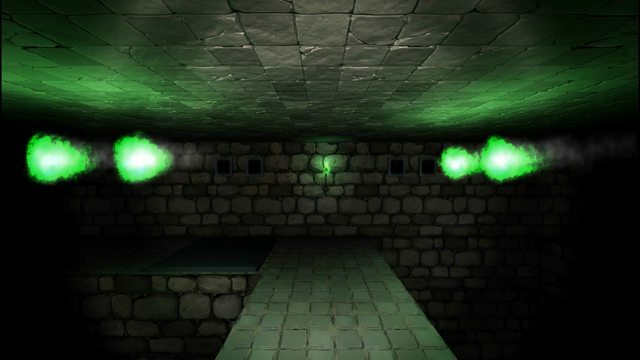 I wanted to give a bit of feedback ; in most of your videos you have a spotlight effect that looks a lot like a "flashlight" and it creates a anachronistic / incorrect feeling that doesn't fit in a dungeon? Otherwise keep up the good work and good luck on the kickstarter! Seems like this could be nice! Definitely want to see more about it. UPDATE: We have been Greenlit! Sorry for the lack of updates here We've been getting on with the game, and also managing both our Kickstarter and Greenlight, but we now have one compelte! New assets and systems are being implemented, so hopefully I will have more technical and other details here soon. Wow, 65% is really amazing. I don't think I've heard of another game with that high of a percentage. Congrats! Thanks! We're really happy with it We've tried our best to create something we hope people really respond to. This week we've been adding new assets, as well as new systems. One such system is a timer for all switches and triggers, allowing us to have multiple targets, multiple timers, all in different modes. 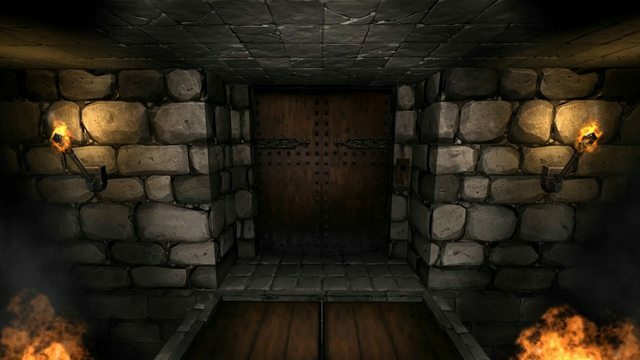 So, you could enter a room and set off a trigger, meaning you have to get to the end before a trap is set off, or alternatively you have a few seconds to get to a door before it closes. Simple additions like this allow for more complicated game-play opportunities. Out Kickstarter is also 75% a week to go! So, today we got out a new Alpha demo, in VR, but also NON VR! New story content, new hazards, improvements to performance, graphics, assets, a new inventory system for collecting items - Crystals to collect - and a whole load more.